Is It Safe To Use Compost Made From Treated Human Waste? : The Salt Treated human waste has been used on farmland for decades, but the ick factor has not entirely faded. Some environmentalists think the treatment process may not get rid of all the harmful contaminants that could be in the waste. Through the City Land Application of Biosolids Program in Geneva, Ill., the fertilizer supplement is provided to local farmers at no cost. Any gardener will tell you that compost is "black gold," essential to cultivating vigorous, flavorful crops. But it always feels like there's never enough, and its weight and bulk make it tough stuff to cart around. I belong to a community garden in Washington, D.C., that can't get its hands on enough compost. So you can imagine my delight when I learned that the U.S. Composting Council was connecting community gardeners with free material from local facilities through its Million Tomato Compost Campaign. I signed us up last month, and was promptly contacted by Clara Mills, the environmental coordinator for Spotsylvania County in central Virginia. Mills volunteered to deliver a dump truck full of compost to our garden from her facility, an hour away. It sounded too good to be true. Then one of my fellow gardeners noticed the source of the Spotsylvania compost: biosolids, or human poop that's been treated and transformed into organic fertilizer. 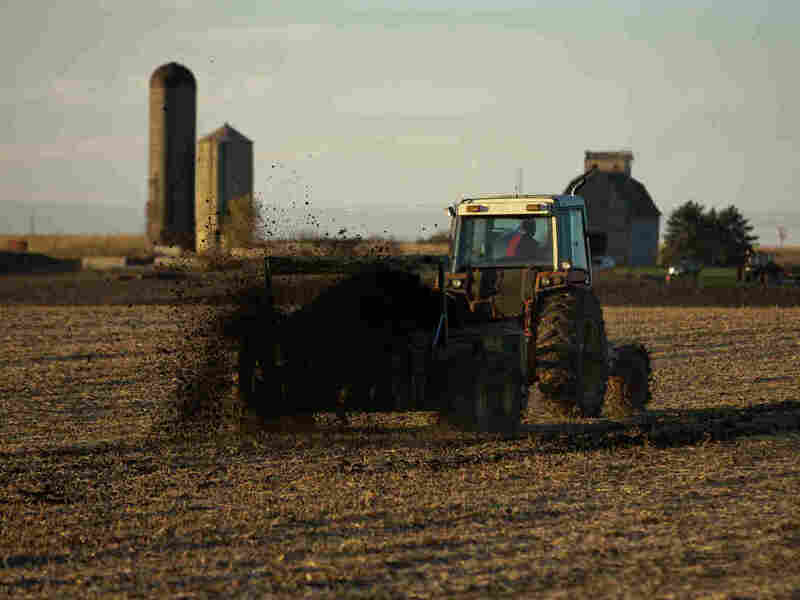 About 50 percent of the biosolids produced in the U.S. are returned to farmland through a process that is heavily regulated by the Environmental Protection Agency. Even so, some people – including the Sierra Club — remain skeptical of the use of this waste product in food production. They worry that heavy metals, pathogens or pharmaceuticals might survive the treatment process and contaminate crops. So what's an urban gardener to do in light of mixed perceptions about whether it's OK to use poop to grow your food? I set out to investigate this, hoping that whatever I learned would help my garden decide whether to accept the donation or not. First, remember that for thousands of years, before the invention of synthetic fertilizer in 1913, many farmers utilized their decomposed sewage, sometimes called "night soil," to replenish the soil with nutrients lost in farming. The Chinese were especially adept at using human waste this way – one historical account notes that in 1908, a contractor paid the city of Shanghai $31,000 in gold for the privilege of collecting 78,000 tons of human waste and carting it off to spread on fields. But the sludge was still piling up in landfills, so scientists began testing how to use it in agriculture safely; the waste was a free source of nutrients like nitrogen and phosphorus, afterall. And letting it sit in landfills or incinerating it created its own environmental issues. By the 1990s, the Environmental Protection Agency created strict standards with two tiers for biosolids still in use today. To sell Class A biosolids to farmers and gardeners, facilities have to ensure that there are no dangerous heavy metals or bacteria in the end product. The ick factor, however, has not faded entirely. While plenty of large-scale farms like this one in Kansas City, Mo., use biosolids, they are not officially allowed in organic agriculture. Bowing to public input, the U.S. Department of Agriculture decided in 2000 to prohibit the use of sludge in the National Organic Program. This was in spite of the fact that "there is no current scientific evidence that use of sewage sludge in the production of foods presents unacceptable risks to the environment or human health," USDA spokesman Samuel Jones tells The Salt. A handful of activists have also sounded the alarm on the widespread use of biosolids in conventional agriculture. They allege, among other things, that the EPA-approved treatment of biosolids doesn't address all the possible contaminants in the waste. Still, some scientists argue that over the years, the biosolids industry has gotten much better at keeping contaminants out of the final product. "We have systemically looked at all kinds of potential hazards," says Ian Pepper, a professor and director of the Environmental Research Laboratory at the University of Arizona who has been studying biosolids for 30 years. "Invariably we've found that the risks are much lower than those suggested by environmental activists." And other proponents say that it's hard to prove that biosolids are a significant source of contaminants. "These compounds are ubiquitous in the environment – in the soil, water, within our bodies," says Neil Zahradka, who overseas biosolids for the state of Virginia's department of environmental quality. "So the question is: If it's in the biosolids, then is that a problem? None of studies so far have been able to conclusively say that yes there's an issue here." As for the pathogens, Zahradka contends that the composting process, one of a few different treatment methods (and the one used in Spotsylvania County, which offered compost to my garden), eliminates them. Here's how it works: Spotsylvania receives the raw sewage and mixes it with mulch. The carbon in the mulch speeds up the decomposition process, and generates heat. The material reaches 160 plus degrees for 21 days, says Mills. That's enough to kill all harmful bacteria, she says. But the facility also tests the material regularly to be sure the pathogens and dangerous heavy metals are below detectable levels. So will my garden be using these biosolids anytime soon? We'll have to take a vote to decide. In the meantime, it's interesting to see other urban gardeners getting on board with biosolids.